My research on Long Island suffragists led me to discover so many other wonderful women, many of whom worked closely with the Long Islanders in their long battle for political equality. I think it is only fitting to remember these heroic women as well, and celebrating their birthday helps to keep the memory of them, and their efforts alive. This month’s honoree is Mable Vernon. Mable Vernon was born in Delaware, September 10, 1883. 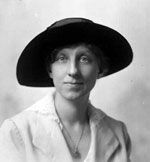 She graduated from Swathmore College in 1906, and in 1913 began working with Alice Paul and Brooklyn’s Lucy Burns at the Congressional Union (later the National Woman’s Party). Loosely overseen by the National American Woman Suffrage Association (NAWSA), the CU had been organized in Washington DC for the express purpose of securing the passage of an Amendment to the Constitution granting women the right to vote. Known for her outspoken personality and publicity-grabbing audacious acts, Mabel interrupted President Wilson while he was making a speech at the dedication of the Labor Temple in Washington DC in 1916. While the President proclaimed his beliefs about liberty and justice, Mable stood up and boldly asked: “Mr. President, if you sincerely desire to forward the interests of all the people, why do you oppose the national enfranchisement of women?” When her question was brushed aside, she daringly asked it again, and was ordered from the meeting by the police. Mabel was among the first group of women to picket the White House. Arrested for “obstructing traffic,” she refused to pay the $25 fine and spent three days in prison. She then took up the formidable task of coordinating the picketing effort, assigning women daily to assure that the line in front of the White House was always populated. She later joined the Prison Special train that toured the country informing the public of their imprisonment and abuse. After suffrage was achieved Mabel worked for passage of the ERA, the Equal Rights Amendment, as well as the issues of disarmament and world peace. She died in Washington DC in 1975.